National Weather Service Forecast, March 12, 2017. 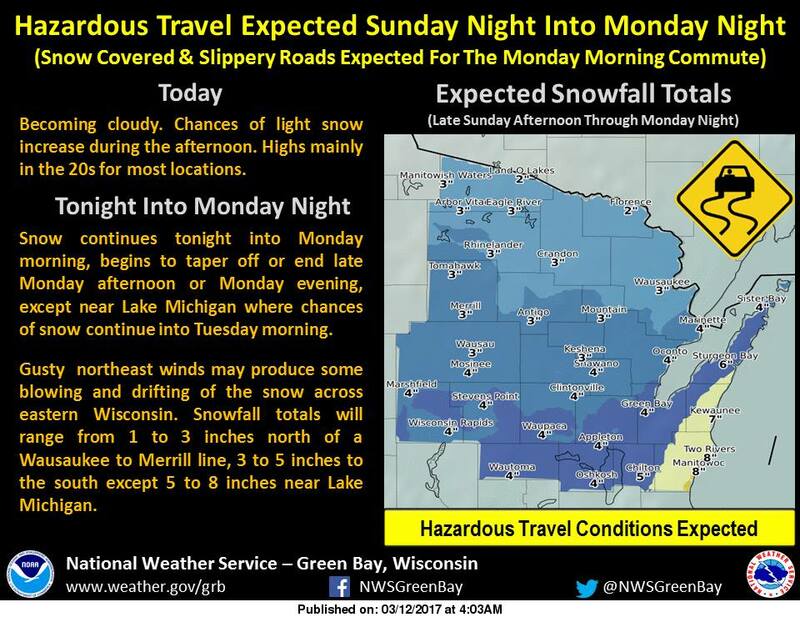 ASHWAUBENON — Snow is back in the forecast beginning this evening, March 12, 2017, and continuing throughout Monday, according to the National Weather Service in Green Bay. Drivers should anticipate snow covered and slippery roads for the Monday morning commute to work or school. The snow should begin to taper off or end later Monday afternoon or Monday night, except near Lake Michigan where the chances of snow will linger into Tuesday morning. After the snow clears, temperatures drop significantly, with a high Tuesday of 28 degrees. High temperatures will remain in the 30s for the remainder of the week. Snowfall totals of 1 to 3 inches are expected north of a Merrill to Wausaukee line and 3 to 5 inches to the south, except near Lake Michigan where 5 to 8 inches is expected. A winter weather advisory begins at 10 p.m. and runs through 10 p.m. Tuesday with the greatest impacet in Kewaunee and Manitowoc counties. The snow will arrive from southwest to northeast with the best lake enhancement is expected to occur on Monday night, according to the weather service. Total snow accumulation is expected to be 5 to 8 inches.